Osteoarthritis (OA) is a degenerative joint disease characterised by loss of articular cartilage, with an associated periarticular bone response. It is extremely common, with prevalence increasing with age. It is the most common cause of disability in the Western world in older adults. The hip is the second most commonly affected joint in the body for osteoarthritis and can be either unilateral or bilateral. In this article, we shall look look at the risk factors, clinical features and management of hip osteoarthritis. The majority of patients with hip osteoarthritis will describe a dull aching pain around the hip, that can extend down the anterior thigh to the knee. It is aggravated by activity and relieved by rest, and the joint may feel stiff after a period of immobility. On examination, patients may have evidence of muscle wasting (in quadriceps and gluteal muscles) and reduced power around the hip joint. A leg length discrepancy or fixed flexion deformity may be present and patients can walk with antalgic or Trendelenberg patterns. Crepitus can be felt on passive movement and there is often a reduced range of movement (both passive and active). Only one or two of these markers may be present; osteophyte formation tends to be evident only in later stages of the disease. Additional further imaging is rarely required, unless other diagnoses are being considered. There are a number of different tools to classify the progression of OA. The Western Ontario and McMaster Universities Arthritis Index (WOMAC) is a well-evaluated measure, which combines 5 items for pain (0-20), 2 items for stiffness (0-8) and 17 items for function (0-68), giving an overall total out of 96. This tool can be repeated to allow for a quantitative evaluation of disease progression. 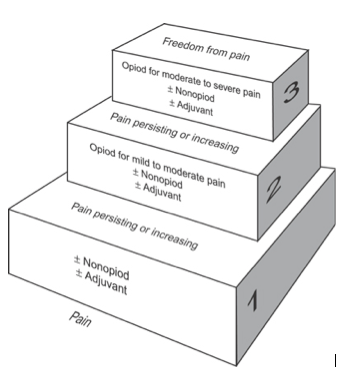 Figure 3 – The WHO pain relief ladder, commonly used in the management of pain due to cancer. Adequate pain control is important, using the WHO analgesic ladder (Fig 3), to ensure ongoing mobility and quality of life. Lifestyle modifications are also essential in aiming to improve self-management, including weight loss, regular exercise and smoking cessation. Physiotherapy is essential and should be provided for all individuals with hip OA, aiming to slow disease progression and improving joint mechanics. If conservative management efforts do not work, surgical intervention is warranted. *Recent developments have worked with hip resurfacing, whereby the femoral head is preserved and capped with a smooth (metallic) surface and the damaged bone and cartilage within the acetabulum is removed and replaced with a metal shell. Common post-operative complications include thromboembolic disease, bleeding, dislocation, infection, loosening of the prosthesis, and leg length discrepancy. Posterior Approach – The most common approach. Rehabilitation is often fast due to preservation of the abductor mechanism, minimising the risk of abductor dysfunction post operatively. However, there is the greatest risk of causing damage to the sciatic nerve. Anterior Approach – This mechanism also avoids the abductor mechanism enabling a fast recovery. There is a low dislocation rate due to the supporting musculature, however there is around a 10% risk of sensory deficit in the distribution of the lateral femoral cutaneous nerve. Anterolateral Approach – The abductor mechanism is detached to allow excessive adduction and thus full exposure of the acetabulum. A merit of this method is that the superior retinacular vessels are not interrupted lowering the risk of avascular necrosis, however there is a risk of damage to the superior gluteal nerve. Lateral Approach – This requires reflection of the hip abductors. The muscles are often divided at their tendinous portion. This approach has a lower dislocation rate than the posterior approach however pain and weakness can remain post operatively. A modern hip prosthesis is designed to last for 15-20 years; therefore, depending on the age at time of replacement, it may never need revising. 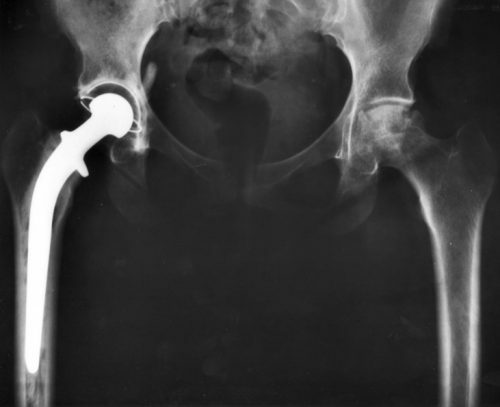 Revision hip replacements are possible, but are subject to greater complication rates. 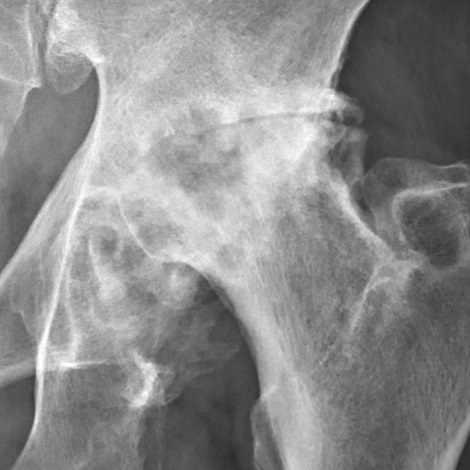 Which of the following hip x-ray findings would indicate osteoarthritis? Which surgical approach to hip arthroplasty carries the greatest risk of sciatic nerve damage?